INSIDE CHORNOBYL [CHERNOBYL] PHOTO EXHIBIT ASKS THE QUESTION  WHY? If you lived at Chornobyl, would you stay? The 25th anniversary of the world's worst nuclear disaster is being commemorated at The Ukrainian Museum in New York in collaboration with the Children of Chornobyl Relief and Development Fund with a provocative exhibition of photographs that chronicle the aftermath of the explosion and explore the lives of the people directly affected by the catastrophe. Produced by photographer Michael Forster Rothbart, the exhibition, titled simply Inside Chornobyl, opened on April 17 and continues through May 8, 2011. The explosion on April 26, 1986, at the Chornobyl Nuclear Power Plant in Ukraine  just 60 miles from the capital, Kyiv  resulted in a partial meltdown of the core of one of the plant's reactors, sending radiation and political shockwaves across Europe. A plume of radioactive fallout contaminated a huge area surrounding the reactor and drifted across parts of the western Soviet Union and nearly all of Europe. After the accident, nearby towns and villages were evacuated and later abandoned. Some 350,000 people lost their homes. In the subsequent clean-up, 850,000 workers were exposed to radiation. As the Chornobyl catastrophe faded from the headlines, it also faded from most people's thoughts. What remained was the popular image of Chornobyl as a wasteland  forsaken, inaccessible, and dangerous. And yet, as Inside Chornobyl clearly captures, life continues in the radiation-affected areas a generation later. Six million people still live in the contaminated region, an area of Ukraine, Belarus, and Russia covering 56,700 square miles (about the size of New York State). More than 3,800 employees continue to work at the Chornobyl plant today. Inside Chornobyl includes photographs taken by American photojournalist Michael Forster Rothbart, additional photographs by Alexander Kupny (a Ukrainian photographer and instructor at the Chornobyl Nuclear Power Plant Training Center), descriptive text, and excerpts from interviews that Forster Rothbart conducted with 82 survivors of the disaster  all documenting the effects of the Chornobyl catastrophe on the surrounding communities. This exhibition and Forster Rothbart's parallel exhibition, After Chornobyl, will travel this spring to Chicago, Philadelphia, and Madison, Wisconsin. Workers check their hands and feet for radioactive contamination one last time at the end of the day, before boarding the train home. Forster Rothbart's goal was to convey the complex story of the Chornobyl survivors who not only stayed, but adapted and survived. "There is suffering," he says, "but also joy and beauty, endurance and hope." 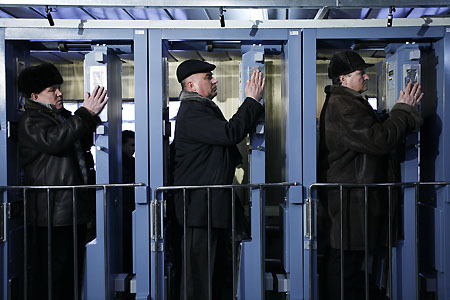 For two years, he followed the daily lives of five families who work in the Chornobyl plant, living side-by-side with them in order to gain access to events and people with an insider's perspective. For many of those interviewed, losing their homes was as traumatic as the accident itself. The evacuees were affected physically, economically, socially  and psychologically. "I heard compelling stories about problems with alcoholism, mental illness, unemployment, and crime," he says. "Some overcame these difficulties, while others surrendered to them." 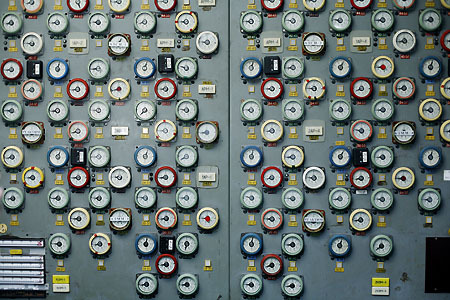 A wall of dials in the 1st Block Control Room once indicated levels for each of the rods in the reactor. Although the plant stopped producing electricity in 2000, nuclear fuel rremains stored in three reactor halls. Photojournalist Michael Forster Rothbart's projects explore the human impact of environmental change. Thanks to a Fulbright Fellowship, he spent two years in Chornobyl, photographing and interviewing Chornobyl evacuees and clean-up workers. After years in Ukraine, Kazakhstan (with the Associated Press), and India, Forster Rothbart now lives in upstate New York, where he continues to work on educational and documentary projects, including Fracking Pennsylvania, which will explore the effects of natural gas drilling on rural communities. Ukrainian photographer Alexander Kupny worked for many years for the Chornobyl Nuclear Power Plant, most recently as an instructor at its Training Center in Slavutych. Now retired, he is working on a project photographing villages in the Chornobyl Exclusion Zone. His new book of Chornobyl photographs is being released in Ukraine this month. In conjunction with the exhibition Inside Chornobyl, The Ukrainian Museum and the Children of Chornobyl Relief and Development Fund (CCRDF) are presenting The Chornobyl Angel Project: A Children's Book Illustrated by Children. Written for children and illustrated by children, Chornobyl Angel resulted from an initiative by Anna Korolevska, the director of the National Chornobyl Museum in Kyiv, Ukraine, who invited students at local art schools to illustrate paragraphs of text from the book; of the 81 watercolors submitted, 24 were chosen for publication. The Ridna Shkola Ukrainian school in Whippany, New Jersey, also took part in the project. Visitors to The Chornobyl Angel Project will have a chance to see, first-hand, 10 of these impressive illustrations. They are on loan from the National Chornobyl Museum and will be shown together with photographs from the Chornobyl Museum's archives. The CCRDF is publishing Chornobyl Angel as a tribute to, and reminder of, the victims of the Chornobyl catastrophe 25 years ago. Together, the CCRDF and the National Chornobyl Museum have dedicated the book to all the men, women, and children around the world who have been affected by nuclear disasters. Chornobyl Angel was launched during the opening of the two exhibitions at The Ukrainian Museum. btw 2nd and 3rd Aves. The Ukrainian Museum acquires, preserves, and exhibits articles of artistic or historic significance to the rich cultural heritage of Ukrainian Americans; its collections include thousands of items of folk art, fine art, and archival material. At its founding in 1976 by the Ukrainian National Women's League of America, the Museum was hailed as one of the finest achievements of Americans of Ukrainian descent; in the 35 years since then, and particularly in the five years since its move to a new, state-of-the-art building in Manhattan's vibrant East Village, it has become known as one of the most interesting and dynamic smaller museums in New York City. Each year, the Museum organizes several exhibitions, publishes a number of bilingual (English/Ukrainian) catalogues, and presents a wide range of public and educational programs, including concerts, films, lectures, courses, workshops, and much more. The Children of Chornobyl Relief and Development Fund (CCRDF) is an international non-profit organization working to save the lives of children across Ukraine through developed life-saving medical programs. CCRDF's primary objective is to strengthen the Women's and Children's Health Initiative Programs in the fields of neonatology, perinatology, infant cardiac surgery, and pediatric oncology. CCRDF also works to improve the quality of life of orphans with disabilities in Ukraine through nutritional, rehabilitation, and educational programs.